The final chapter (for now! 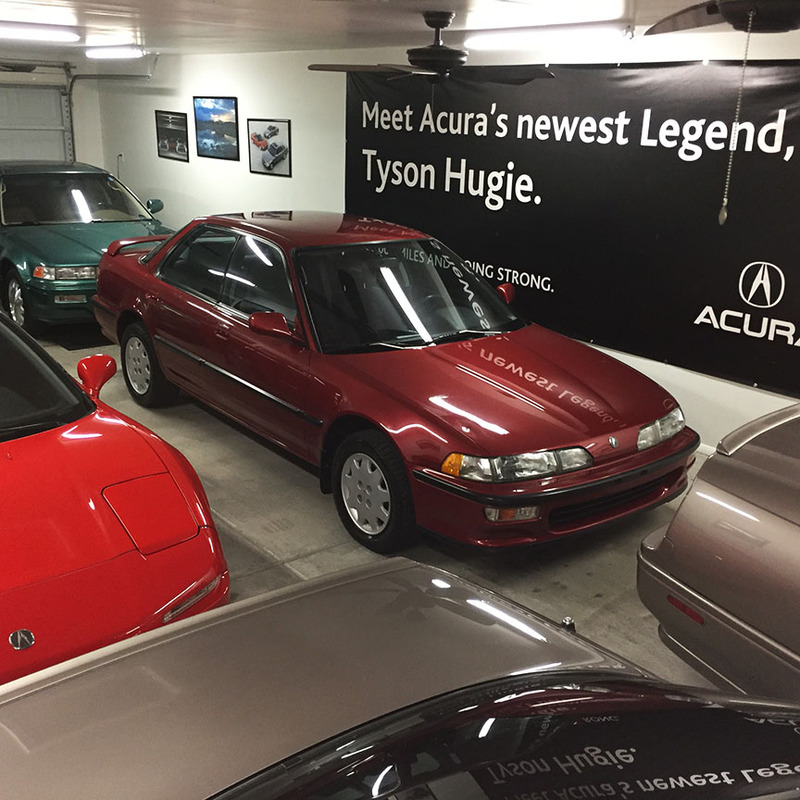 ): After two whirlwind trips from Phoenix to the San Francisco Bay Area — one to bid on the Integra, and another to pick it up, I finally had the car back home at my garage. Of all the cars in the collection, it needs probably the most work – both mechanically and cosmetically. The long list of to-do items will be addressed in due time – a long time – as the Integra will probably only be driven occasionally. I wasted no time in heading over to the self-service car wash and getting the undercarriage and wheel wells all shined up. I spent time that same day on the door jambs, the interior, wheel covers & tires, and trunk. I’ll leave a complete engine bay detail for a later date – that task can take up to an entire day in itself. The results achieved after just a simple one-step cleaner/wax with Meguiar’s are pretty remarkable, so I’m happy about that. I’m waiting for my California title to arrive in the next couple of weeks so meanwhile I’m rolling around on the existing tags until I get it registered in Arizona. Meanwhile I’m thrilled with the little project for the time being and it fits well in the garage. Color coordination was not 100% intentional, but I did end up with 2 greens, 2 reds, and 2 tans. Here’s a 13-minute video on how my detail day went. 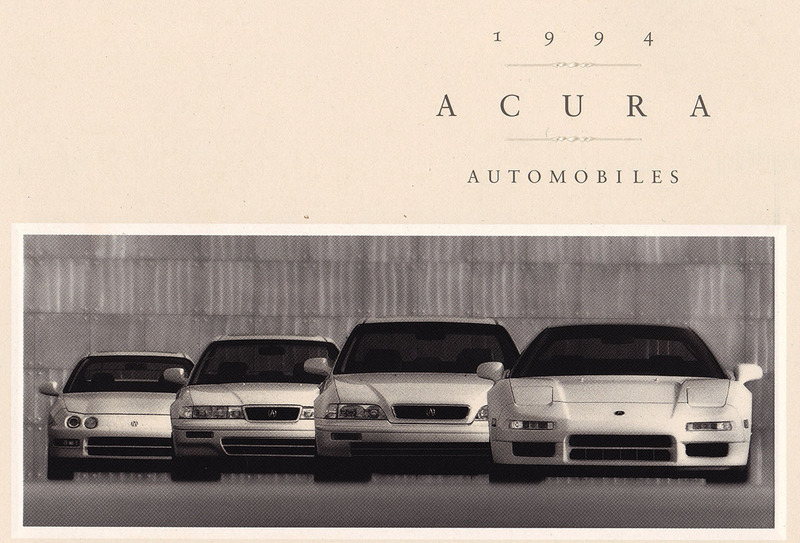 Just for fun: I thought this would be kind of a cool time to share some scans and verbiage from my vast collection of Acura literature. Below are a few things I pulled out. Some automakers, even those claiming a hundred years of experience, feel there’s safety in doing the expected. Even fairly new arrivals in the luxury car market don’t deviate much from fairly rigid boundaries. 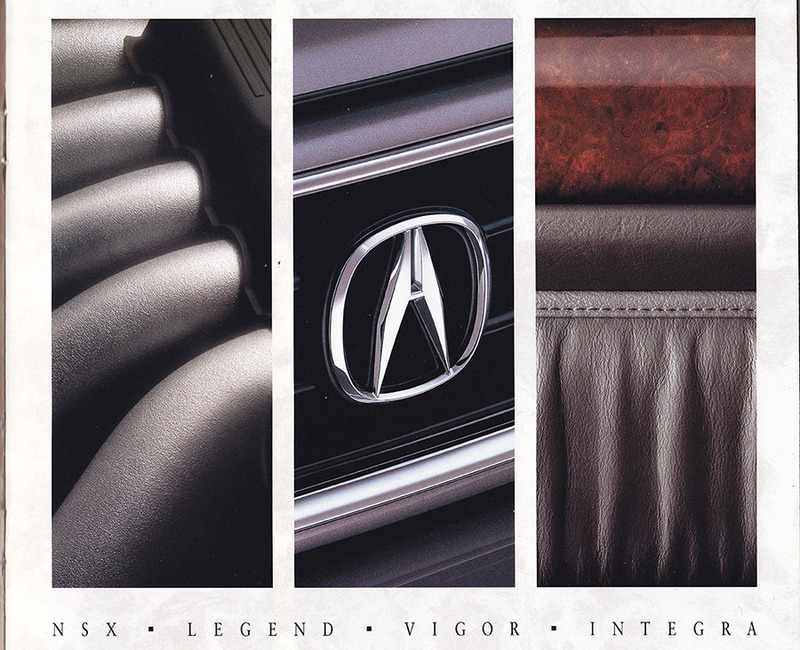 At Acura, we operate under a different set of rules. Actually, there are only three rules. Build the best. Be at the leading edge, and pour all your passion into it. Apparently, it works. 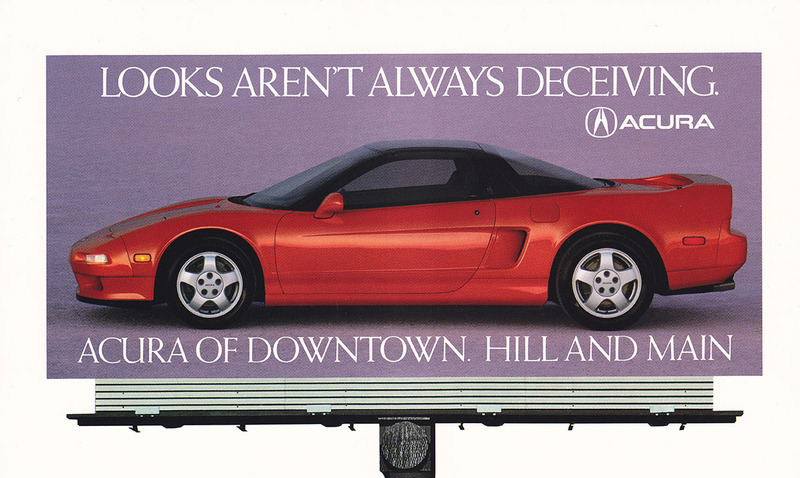 The Acura NSX has been called “the best driving experience available from anywhere in the world.” It’s amazing what a car company can accomplish when it refuses to follow the same old ruts in the road. 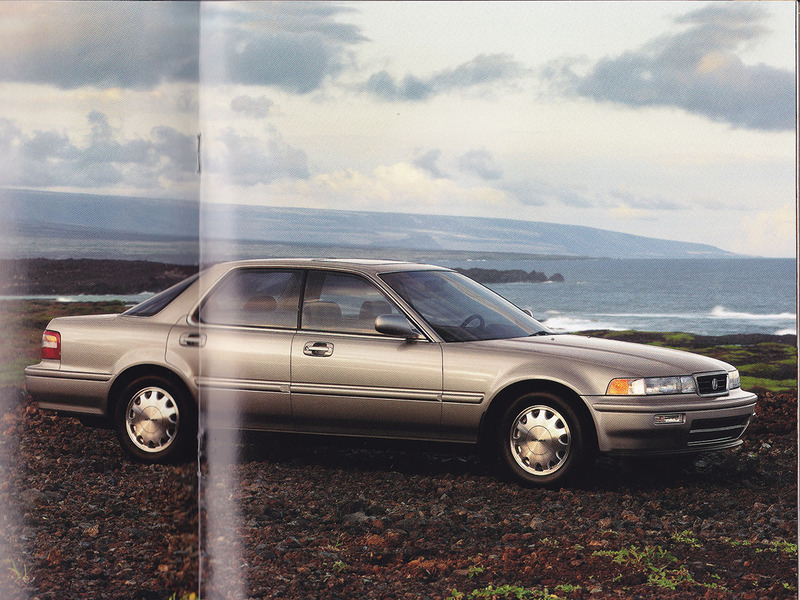 Acura tailored each of its vehicles at that time to cater to a certain attribute or goal. 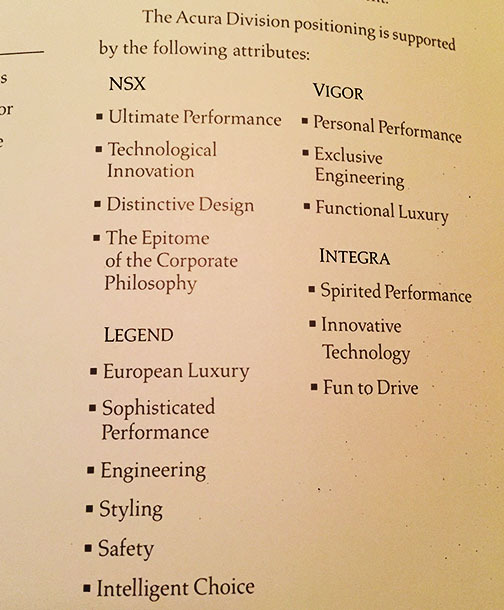 NSX: It takes just one word to express the unique philosophy that inspires every Acura automobile: NSX. 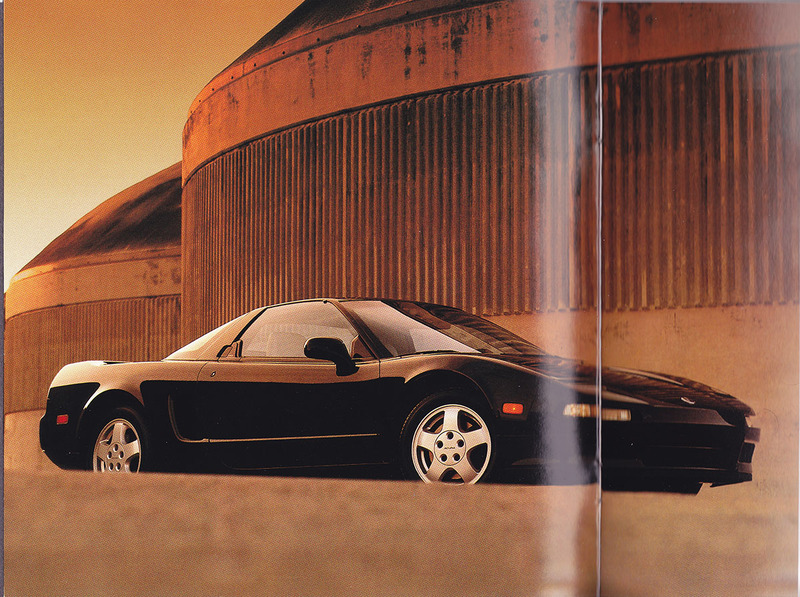 Conceived as the ultimate exotic sports car, the NSX was designed to achieve the razor-sharp response, breathtaking performance, and delicate balance of a Formula One race car, but with the poise, reliability, and ergonomic excellence of a world-class grand-touring automobile. The result is one of the most acclaimed exotic sports cars ever offered to the public. 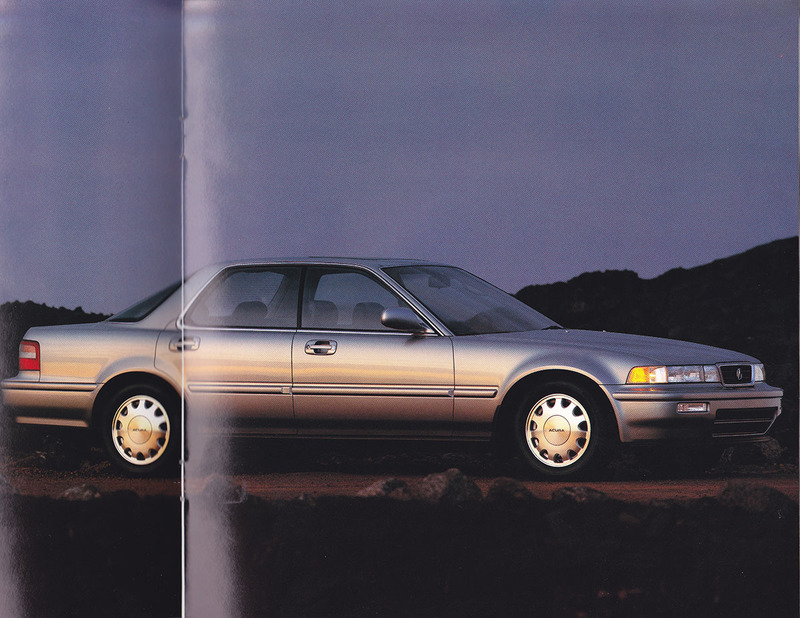 Legend Sedan: In designing the second-generation Legend sedan, we made a courageous decision, especially in light of the stunning success of the original Legend sedan. We started over. After five years of intensive research and engineering, the completely new Legend sedan emerged, a combination of the best in automotive design. 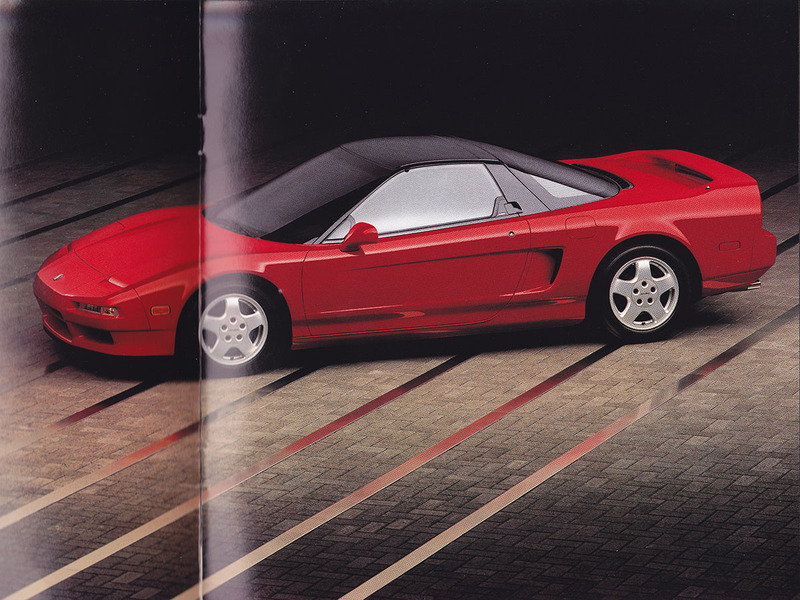 It is graced with precise, sure-footed handling, developed from lessons learned designing the scalpel-sharp NSX. Exhilarating acceleration, motivated by an aluminum V-6 with an impressive Grand Prix pedigree. An elegant interior environment of intelligent design and painstakingly developed ergonomics. 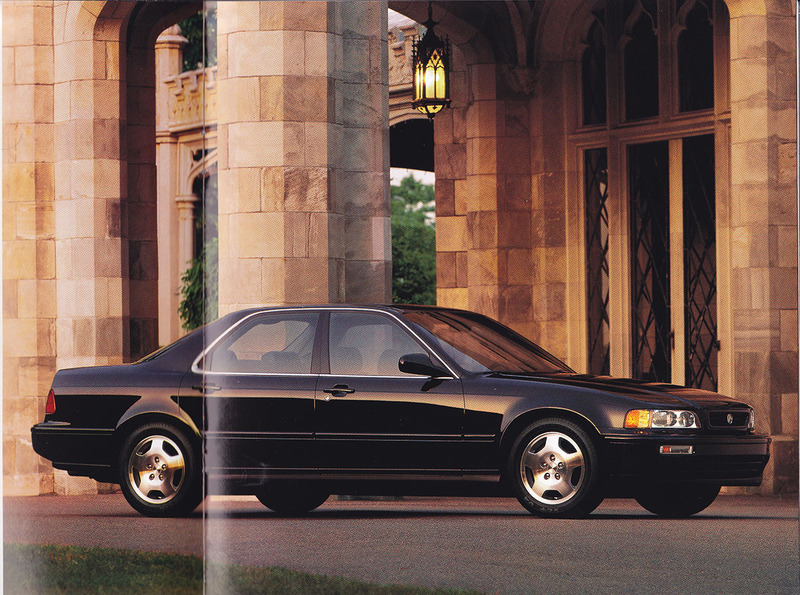 And the high levels of sophistication, dependability, and safety for which Acura has become justifiably famous. 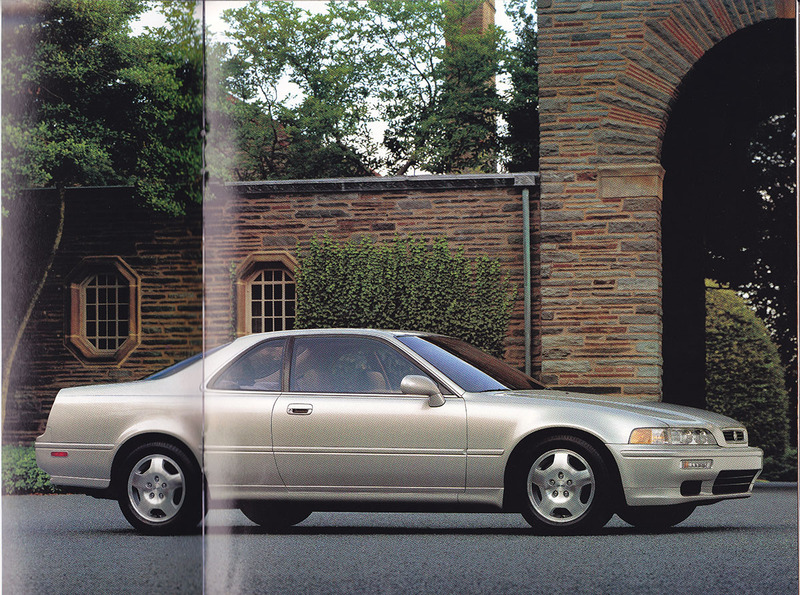 Legend Coupe: One look at the sculpted shape of the Legend coupe tells you what this automobile is designed to do: knife through the wind with speed, poise, and grace, leaving only a murmur in the air to signal its passage. In Europe the Legend coupe will be called upon to cruise at speeds over 130 miles an hour, a level of performance that magnifies the significance of even the most subtle advance in aerodynamics. From its steeply-raked windshield and backlight to its flush-mounted windows and low-profile grille, the Legend coupe is much more than beautiful – it is the product of countless hours of wind-tunnel testing. 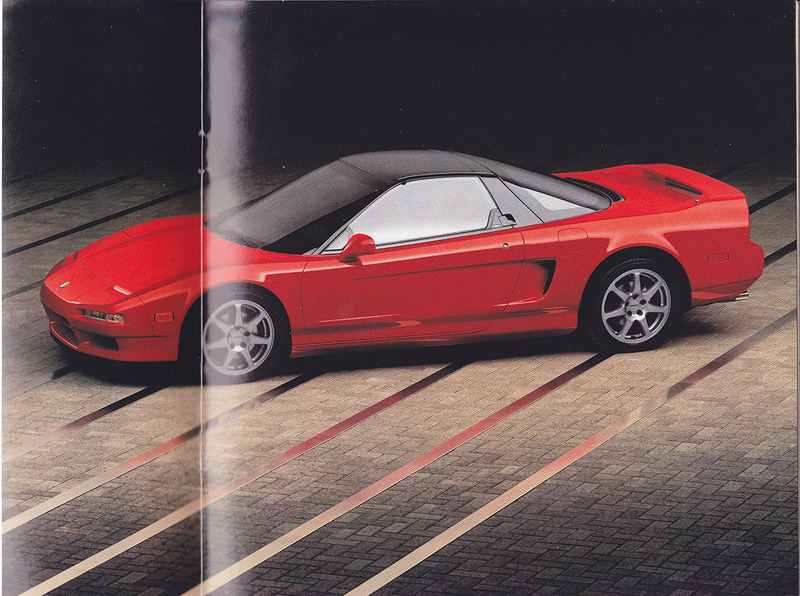 Vigor: The design goal for the 1992 Vigor was a supremely challenging one: to combine the best of automotive technology, creating a uniquely satisfying personal performance sports sedan. Start with the confidence-inspiring dynamic balance of the NSX. Add the distinctive style and interior ambience of a sophisticated touring coupe. Factor in the responsiveness and agility of a lightweight sports sedan. 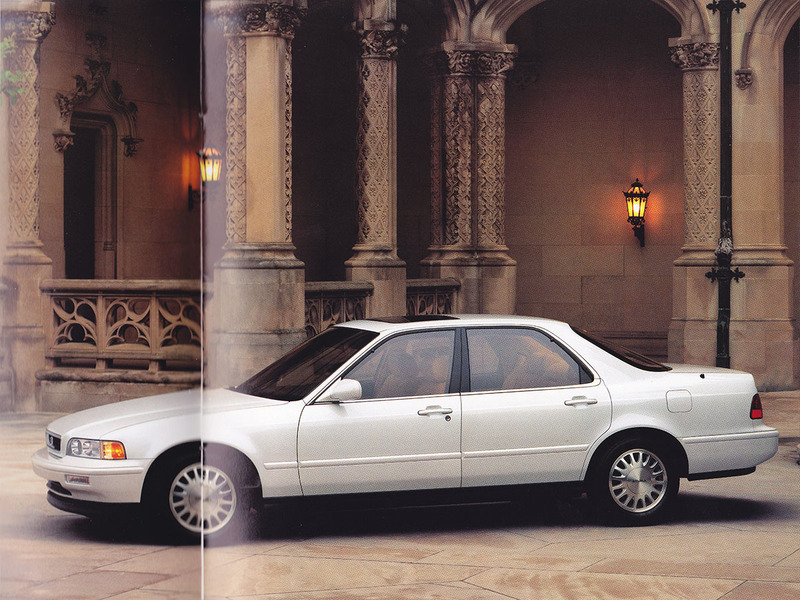 Incorporate the security and elegant practicality of a four-door luxury automobile. And bring together these qualities in an aggressive, yet eminently usable, personal sports sedan – delivering the excitement and performance of a world-class sports coupe, but with the universal appeal of a four-door road car. 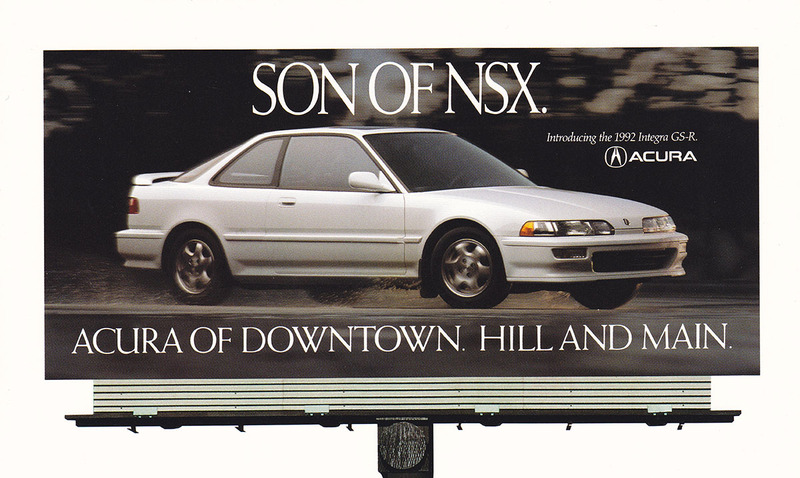 Integra: Since their introduction, the Integra 3-door and 4-door sports sedans have earned a reputation for stirring performance, exhilarating agility, extraordinarily refined road matters and intelligent ergonomics. Many automakers would be reluctant to change such an impressive automobile, one labeled “… a superb car” by no less an authority than Car and Driver magazine. 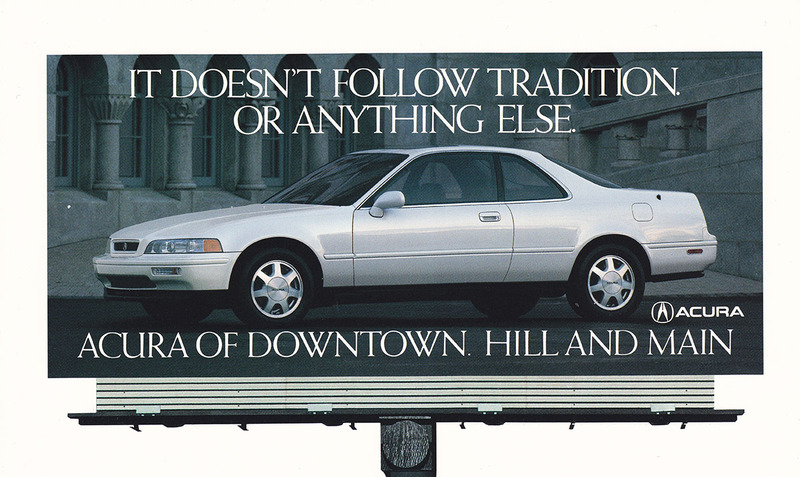 But not Acura. 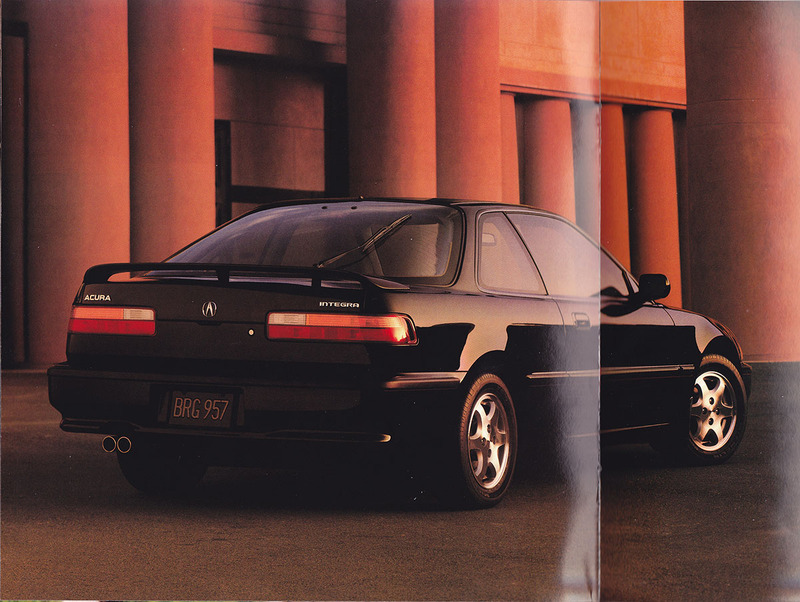 The 1992 Integra has been substantially improved, with significant advances in engine power, driveline smoothness, interior detailing, and aerodynamics. Every Acura automobile has been meticulously inspected and tested to ensure the high levels of reliability and durability which the Acura name has come to signify. Many car companies claim to build satisfying cars, but the Acura Division has an impressive record of top rankings in both short-term and long-term customer satisfaction surveys to back it up. 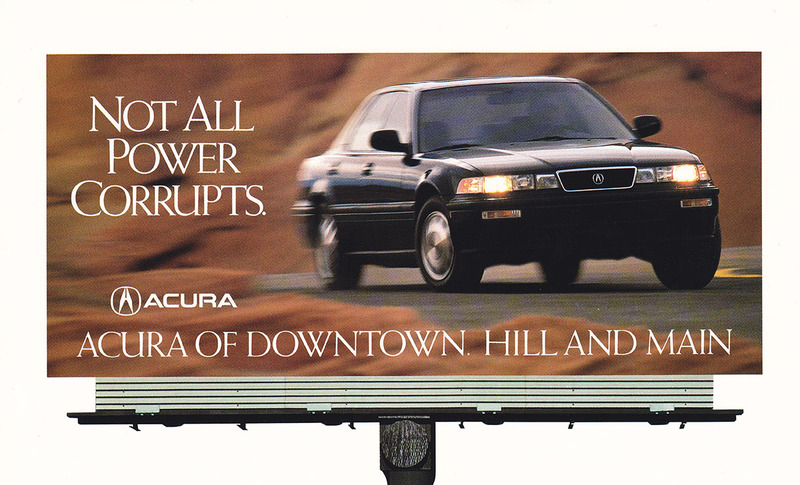 Most recently, Acura has ranked best in the J.D. Power and Associates Vehicle Performance Index (VPI), a survey that measures the operating performance and overall comfort of a vehicle after three full years of ownership. 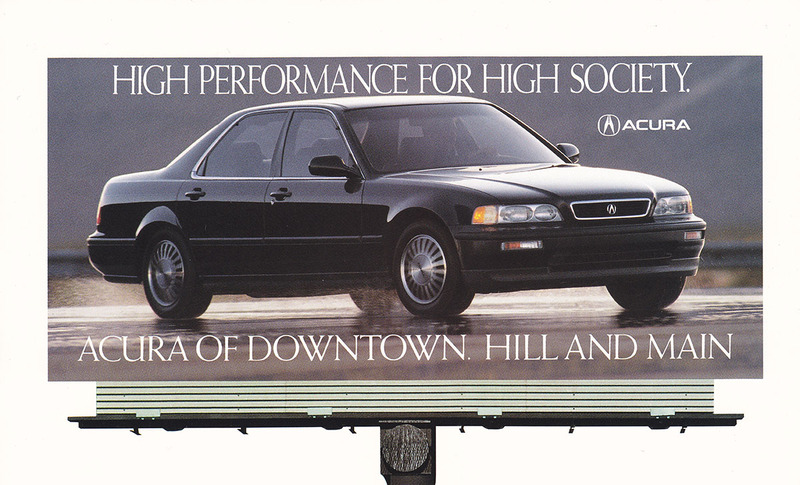 The interesting thing was to consider the demographics of Acura’s customers at the time. This is a chart found within a massive, boxed “Dealer Kit” I got my hands on many years ago. 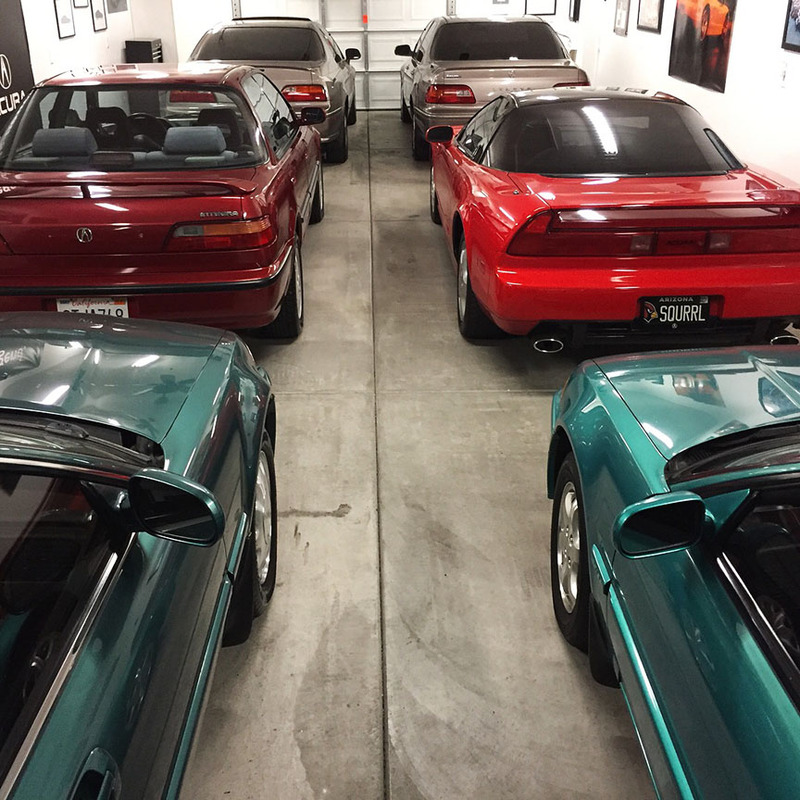 The average NSX owner was 44 years old with a $230,000 household income. That’s $396,000 today. Big money. 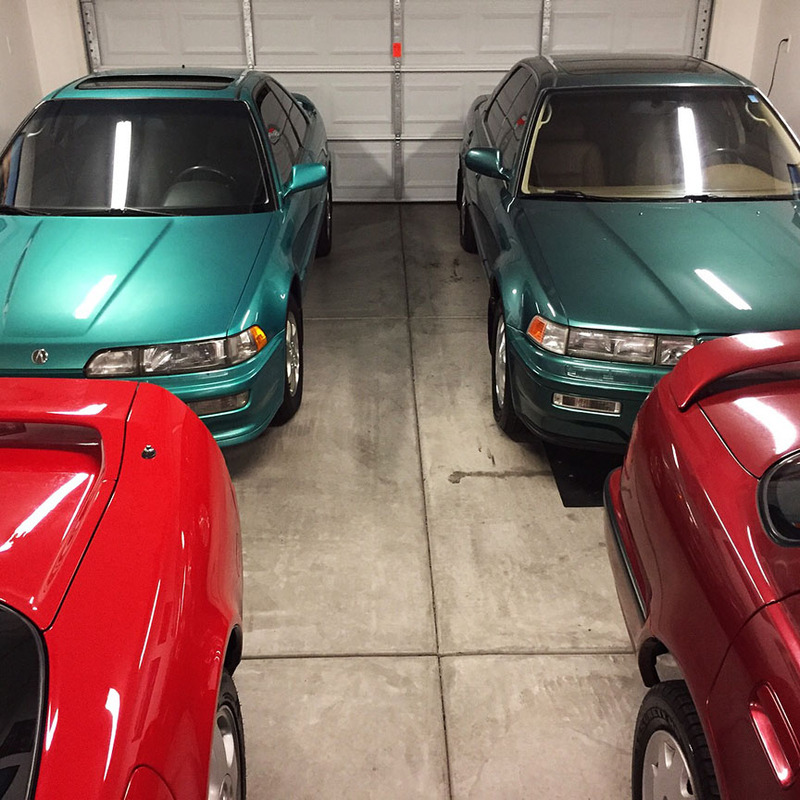 1994 was the change-over to the “bug eye” Integra in the full-line photo below so that’s why my collection is better described as 1991 through 1993 era, even though the Legends and Vigor are 1994. This entry was posted on March 24, 2018 at 6:08 am and is filed under Detailing, Integra. You can follow any responses to this entry through the RSS 2.0 feed. You can leave a response, or trackback from your own site. 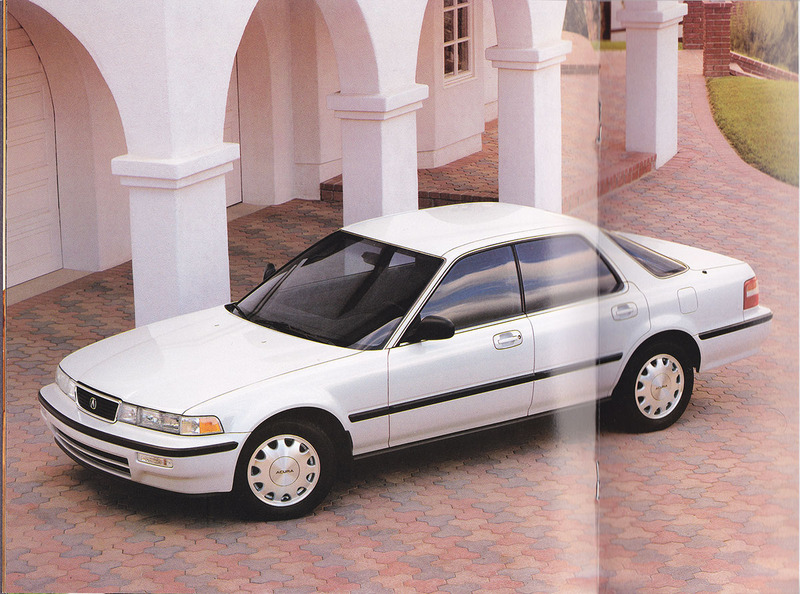 I love the look of that 1992 white Acura Vigor. 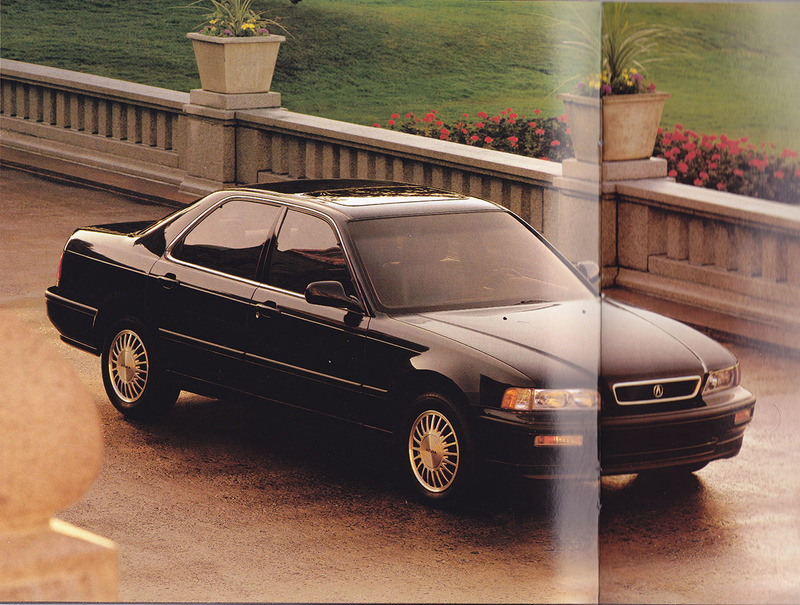 Very similar to the 1990-1993 Honda Accord EX sedan. 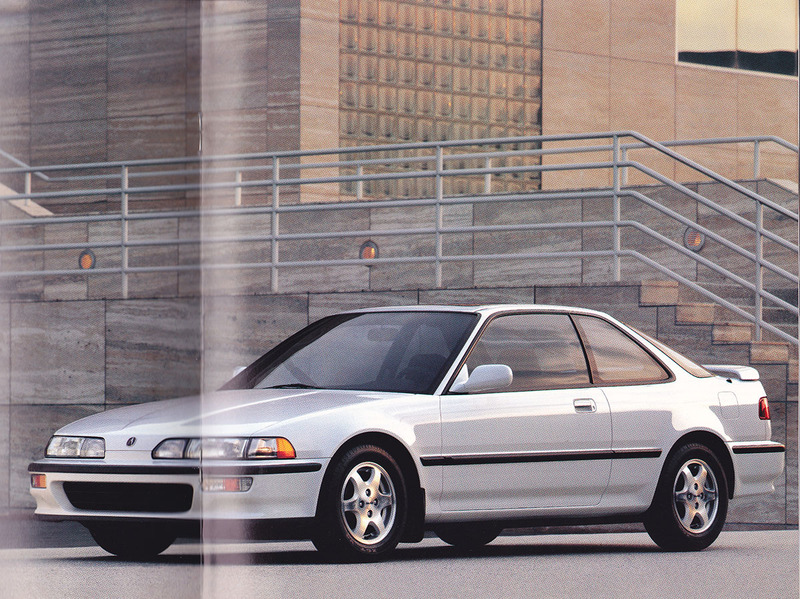 Also, the Acura Integra you just bought is very nice. The color is beautiful. Do you believe that that is the original factory paint job or has it been repainted after 1992? 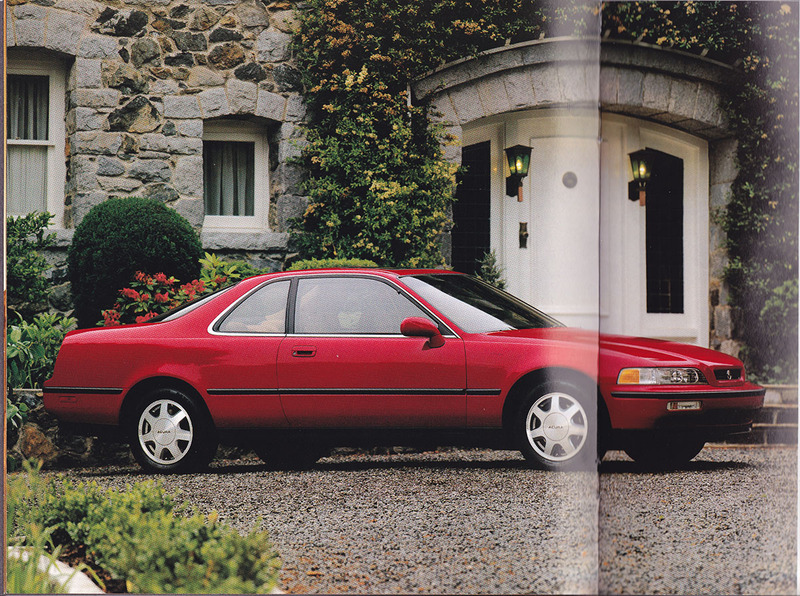 Hi Carlos, you’re right, the 1990-93 Accord and 1992-94 Vigor share a lot in terms of design and proportions. They can easily be mistaken for one another. I do believe my Integra’s paint is original. The top panels show a little bit of clear coat fade so I’ll do my best to keep it garaged all the time and keep the Arizona sun’s rays off it. I haven’t been back to see Tait and his 1982 Prelude yet but I’m going over there this coming week, so stay tuned. Thanks Carlos! Average annual income of hundreds of thousands of dollars…. Now I know why a new NSX isn’t sitting in my garage! Haha, I love it. Any day feels like Christmas when there’s a new toy in the garage waiting to be played with. 🙂 Thanks Pam! Loving the colour coordination in the garage, a nice touch! Don’t forget that you’ve got that reversing light out too. I was meaning to ask how much it cost you in fuel to get the Integra home? Is it on-par with the GSR? Looking forward to an engine bay detail at some stage. Cheers. Thanks Adam! You know, I didn’t save receipts or keep track of expenses on the way home (I really at the time more concerned about just getting there!). I did however save my first fill-up gas receipt. That’s a weird tradition every time I buy a “new” car. I save the receipt from the first time I put gas in the tank. Haha. I suspect this car will get in the high 20’s / low 30’s MPG wise. Great job getting her all cleaned up. From the video and photos, it looks minty fresh. As others have mentioned here, I LOVE the color coordination! 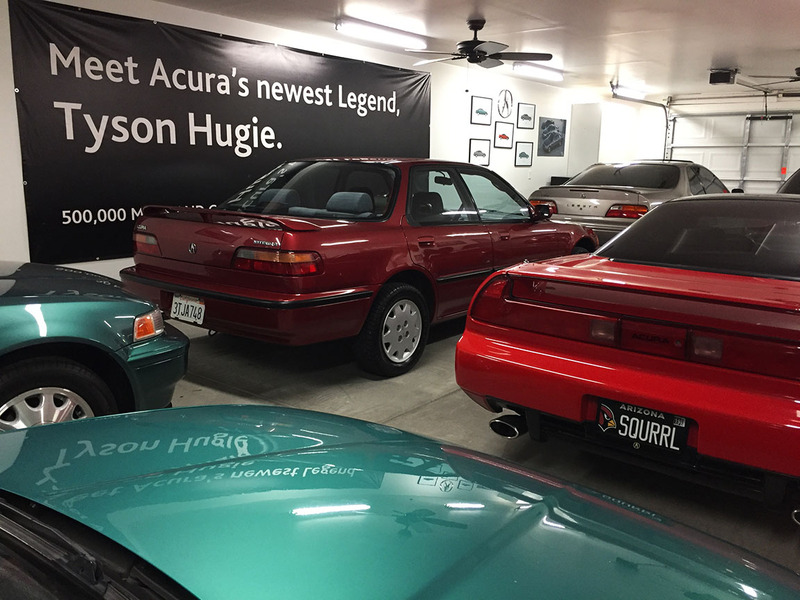 Garage now looks complete. What’s going to be the daily these days? I’ve given this a lot of thought and you know what we need? Ever notice how much lower our cars sit compared to newer models? Well this would definitely help save our backs… least that my justification. But with your growing collection I could see this making sense (sort of). I know you don’t get into bottom side work as much as I do but even for detailing this would absolutely help. Yes! I have looked into QuickJacks. My brother Payton has one and uses it frequently when he’s working on his Lexus IS300. Pretty slick setup. It would definitely be handy for detailing for a few reasons. It lengthens the suspension travel of the wheels for easier access to wheel wells. It also gets the car up off the floor so you don’t have to sit on the floor or crouch down. In fact you could probably roll around on a small wheeled stool or something along those lines. Something to think about! Final stretch of my drive home from CA today in the Vigor, leaving shortly from my motel. Come to think of it, this one will be due for some Hon-Man time and a detail again now too. It’s never ending. Hope you’re having a great weekend. The ‘Teg looks great Tyson, and the tour took me back to my childhood- there is something about the interior of a late-80’s/early 90’s Honda product that just looks and feels right to me. The textured seat cloth screamed Honda (in a good way). Looking forward to reading about your adventures with the new ride!